A wide assortment of subject matter is included here, largely speaking, it's all the books that aren't quite comfortable in any other collections; many of these are newer publications, most of the rest are older publications of more or less an individual nature. The Quiz Books have also been included here. 1949 The Locomotive Exchanges, by Cecil J Allen, published 1949. Cover photo of unrebuilt 'Merchant Navy' Class Pacific 35019 "French Line CGT". 1950 New Light on the Locomotive Exchanges, by Cecil J Allen, published 1950, 60pp. Hardback (white) with dust jacket. 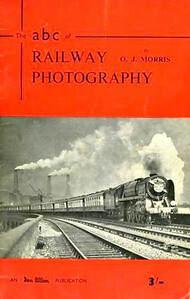 1952 Railway Photography, by O J Morris, published July 1952, 33pp 3/-. Cover photo of a 'Britannia' Class 4-6-2 hauling 'The Golden Arrow', with Battersea power station as a backdrop. 1960 Railway Quiz, published January 1960, 32pp 1/6, code: 292/1001/20/260. Cover photo of A4 Class Pacific 60013 "Dominion of New Zealand". A6 size, same as most railway ABCs. 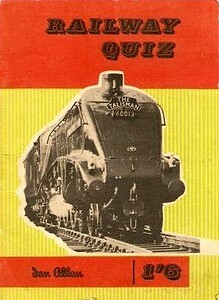 1960 Railway Quiz (reprint), published June 1960, 32pp 1/6. Larger format than the January 1960 original. Cover photo of A4 Class Pacific 60013 "Dominion of New Zealand". 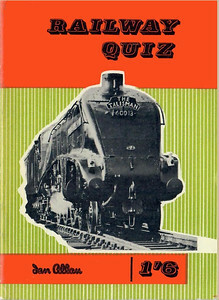 1960 Railway Quiz, published January 1960, 32pp 1/6. Cover photo of A4 Class Pacific 60013 "Dominion of New Zealand". This edition appears to be yellow instead of green, this may well be a result of fading. 1963 British Railway Bridges, by David Walters, published March 1963, 72pp 3/6, code: RB/1210/10/125/363. Cover photo shows Brunel's Royal Albert Bridge at Saltash. 1988 BR Motive Power Depots: Western Region, 1st edition, by Colin J Marsden, published June 1988, 112pp £8.95, ISBN 0-7110-1769-7. Hardback with laminated cover, 220 mm x 140 mm. Cover photo of diesels around the turntable at Old Oak Common TMD. This series doesn't appear to have extended past the Western Region edition. 1994 Railway Terminology, 1st edition, by B K Cooper, published September 1994, 96pp £6.99, ISBN 0-7110-2266-6, no code. Cover photo of a 'Eurostar'. Issued as a BCA edition at the same time. 1996 National Railways: A Guide To The Privatised Railway, 1st edition, by John Glover, published June 1996, 128pp £8.99, ISBN 0-7110-2457-X, no code. Cover photo of a Class 319 EMU. Issued as a BCA edition at the same time. 1997 Railway Accidents, 1st edition, by Stanley Hall, published November 1997, 128pp £7.99, ISBN 0-7110-2549-5, code: 9711/D. 1998 Privatised Railways, 1st edition, by John Glover, published June 1998, 128pp £8.99, code: 9806/C2, ISBN 0-7110-2571-1. Cover photo of Class 73/1 73131 in EWS livery hauling the VSOE..
1999 Railway Freight Operations, 1st edition, by P D Shannon, published July 1999, 96pp £8.99, !SBN 0-7110-2660-2, code: 9907/C. Issued as a BCA edition at the same time. 1999 Railway Operations, 1st edition, by John Glover, published November 1999, 96pp £8.99, ISBN 0-7110-2689-0, code: 9911/C. Cover photo of a Virgin Trains HST at York. Issued as a BCA edition at the same time. This particular cover differs slightly from the actual published edition (see next photo); this is no doubt a promo shot. 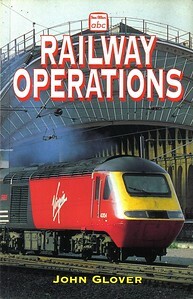 1999 Railway Operations, 1st edition, by John Glover, published November 1999, 96pp £8.99, ISBN 0-7110-2689-0, code: 9911/C. Cover photo of a Virgin Trains HST at York. Issued as a BCA edition at the same time. This is the published version, with the Virgin HST image being larger. 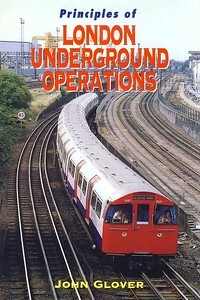 2000 Principles of LOndon Underground Operation, 1st edition, by John Glover, published November 2000, 160pp £16.99, ISBN 0-7110-2739-0. Hardback with dust jacket, large format 23.5 cm x 16 cm. 2010 Railway Depots, 1st edition, by Paul Smith & Philip Stuart, published June 2010, 128pp £12.99, ISBN 0-7110-3482-6, code: 1006/X, hardback, A5 format. Cover photo of 66701 "Whitemoor", 66711 & 66730 at Peterborough New England Depot. Gives details of Depots & Stabling Points throughout Britain, complete with diagrams of depot layouts. 2010 Railway Depots, 1st edition, by Paul Smith & Philip Stuart, published June 2010, 128pp £12.99, ISBN 0-7110-3482-6, code: 1006/X, hardback. Gives details of Depots & Stabling Points throughout Britain, complete with diagrams of depot layouts. This is yet another stock photo, not used on the actual books; I don't know where the cover photo is of, it doesn't appear in the actual book. 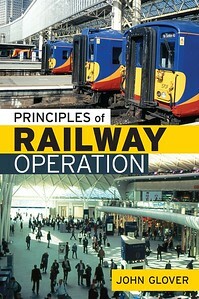 2013 Principles of Railway Operation, 1st edition, by John Glover, published February 2013, 160pp £25.00, ISBN 0-7110-3631-4. Hardback, large format 23.3 cm x 16 cm. 2015 Railway Quiz Book, Now & Then, by Kevin Robertson, published November 2015, 80pp £7.99, ISBN 0-7110-3832-5, no code. Cover image is of ex-LNER 'A2' class Pacific 60512 "Steady Aim" by A N Wolstenholme. This image was originally to be found on the cover of the Eastern & North Eastern Region Locomotives (with locoshed) published in January 1951.